NY – The Adirondacks: Whose Park Is It Anyway? America’s largest state park is a battleground between conservation activists and small towns desperate for development. Brian Wells looks out over the Cedar River at the end of an old dirt road deep within the Adirondack Park in upstate New York. The road is in the town of Indian Lake, and he is town supervisor. For years, Wells has fought to build a bridge over the river to a connecting trail on the other side as a way to attract snowmobilers, horseback riders and hikers. Like many other rural municipalities within the park, Indian Lake has seen its economy suffer a slow and steady decline over the past several decades. A large furniture manufacturer left long ago, and few jobs in the logging industry remain. When Wells was growing up, there were many more diners and gas stations all along the main throughway. The mild winter this past year meant fewer skiers and snowmobilers, leading both a local motel and a diner to close their doors for good. Twice as many students were once enrolled at the local school as there are today. But construction of the bridge and trail are on hold for now. Environmental groups have filed a lawsuit to block the project, arguing it violates state law and is redundant given the existence of other trails in the area. It’s just the latest in a long line of debates over development that have been playing out in the park for several years. 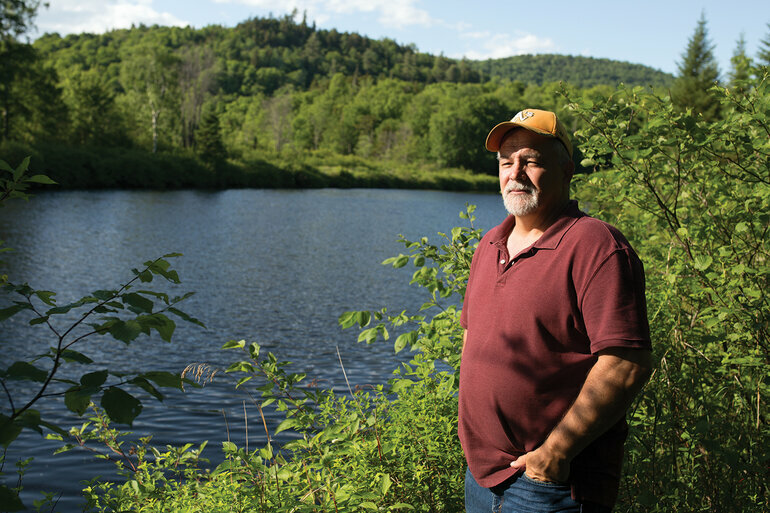 All across the Adirondacks, small towns and villages find themselves in a struggle for survival. With mining and logging jobs nearly gone, with businesses closing and with the population growing older, the towns are looking for any way they can find to halt the decline. Frequently, though, efforts to revive local economies come into conflict with concerns over preserving the park. The battle between conservation groups and pro-development town officials amounts to a dramatic test for a park long viewed as one of the country’s grand experiments in conservation. The Adirondack Park is, in many ways, unlike any other in the nation. Roughly the size of Vermont, it is the largest publicly protected area in the contiguous United States. It’s a patchwork quilt of public and private property; the state of New York owns just under half the land. It is distinctive in another important way: There are 102 towns and villages within its boundaries, and it is home to more than 130,000 year-round residents. https://www.stateparks.org/wp-content/uploads/2016/06/NY-SP-logo.png 128 125 NASPD http://www.stateparks.org/wp-content/uploads/2017/08/Americas_State_Parks_Logo-300x188.jpg NASPD2016-07-30 17:25:332016-07-30 17:25:33NY - The Adirondacks: Whose Park Is It Anyway? EMINENCE, Mo. (AP) – A 440-acre swath of southern Missouri that the governor considered a former “drug haven” is the newest state park, giving nature-loving tourists additional access to trails, caves and streams. About 330 acres of what now is Echo Bluff State Park in Shannon County had been known as Camp Zoe, which had a music venue and was raided in 2010because of outdoor drug sales. Land owner Jimmy Tebeau forfeited the camp to the U.S. government and went to prison. The Missouri Department of Natural Resources bought the land at auction and added 100 acres. Tens of millions of dollars later went into building a lodge, playground, campgrounds, pavilions and two-bedroom cabins. Gov. Jay Nixon calls Echo Bluff a centerpiece to the region’s tourism. The new park abuts the 80,000-acre Ozark Scenic Riverways, the national park popular for canoeing and fishing on and along 134 miles of the Current and Jacks Fork rivers. Echo Bluff also borders a forest reserve. Yet the project has drawn scrutiny, largely from critics questioning the spending on such things as a $5 million bridge built over the park’s Sinking Creek while they say a new bridge is badly needed on a highway just outside the park. The state’s 88 state parks and historic sites have been funded with a one-tenth-cent sales tax that residents have voted to renew in 1988, 1996 and 2006, Nixon said. It will be on the ballot again Nov. 8. Nixon added that $69 million has been spent on upgrades since he took office in 2009, and park attendance exceeded 19 million in 2015 – a 30 percent jump since 2008. The state says visitors contribute more than $1 billion to the economy and thousands of jobs. Given the extensive coverage of the recent Democratic and Republican national conventions, below are positions on conservation and natural resources that may be of interest. This position serves as the Marketing Director for Delaware State Parks and is responsible for development and execution of a marketing plan/program to include campaigns and partnership development to brand and market State Park products and services. This would be accomplished through various platforms including but not limited to print, web, social media, trade shows and other electronic and interactive mediums. Duties will include overseeing the special events which may require availability on some weekends/holidays. This position is responsible for managing all aspect of park operations including employee supervision and evaluation at Clayton Lake State Park. This position also assists visitors and completes facility, grounds and equipment maintenance; collects and processes revenues, performs administrative functions, coordinates special events, provides interpretive programming and other duties. Represents the park while attending or conducting meetings, plans for park development, and oversees construction projects and contractors. To apply: please visit the State Personnel website at www.spo.state.nm.us to submit your application and transcripts. Please make sure that you have received an email confirmation stating that you have applied successfully. Please contact the SPO Career Services Bureau at (505) 476-7759 if you do not receive a confirmation email or have trouble during the application process. CHANNAHON – Channahon State Park will be home to a one-of-a-kind memorial for military veterans who have lost their battles with post-traumatic stress disorder. The Forgotten Warrior Memorial Wall will be a tribute to all veterans who have served in the U.S. Armed Forces and have been afflicted with PTSD and sacrificed their lives beyond the limits of active duty. The memorial, expected to open in November, was funded through private donations to Chicago-based nonprofit K9s For Veteran Warriors. K9s For Veteran Warriors CEO Michael Tellerino said it’s proper to have memorials for veterans who lost their lives in battle; however, currently no memorials exist for the countless veterans who have taken their own lives while fighting another war at home – PTSD. One statistic Tellerino cited suggests about 22 veterans commit suicide each day, but that’s just based on veterans who have registered for benefits. He said the real number is between 28 and 32 a day. The memorial, which will cost more than $80,000, will be constructed in an existing circular turnaround area of the park and be comprised largely of granite. Tellerino initially wanted to etch the names of each veteran lost to PTSD into the memorial, but said it would be an exhaustive process to get every name from the U.S. Department of Veterans Affairs. Instead, families will have individual bricks etched with their loved ones’ names on a volunteer basis. He said that since announcing the memorial last week, he received a call from a woman in tears. The organization chose Channahon because it has easy access from the Chicago metropolitan area and the specific spot in the park is perfect for what the architects of the project have designed. The nonprofit also wanted the memorial to be relatively close to Marseilles, which is home to the Middle East Conflicts Wall Memorial along the Illinois River. Illinois State Parks and Recreation and state legislators have already signed off on the project, he said. A Missouri girl found a 1.53 carat white diamond while wet sifting with her grandmother. Grace Houston, 9, was on a mission to find a diamond on July 23, and she did just that. According to Betty Coors, who is a Park Interpreter at Crater of Diamonds State Park in Murfreesboro, Grace found a 1.53 carat white diamond, KTHV reported. It all started when Grace’s family planned a surprise trip to Crater of Diamonds State Park about six months ago. The young girl’s love for geology was quickly rewarded, as she stumbled upon a valuable white diamond. When asked if she would turn the diamond into a necklace or save it for an engagement ring when she got older, Grace said it was out of the question. “No! I would never put such a rare and special and precious thing into an expensive piece of jewelry,” Grace said, notes WGRZ. Grace said she intends to keep the diamond in its natural state. The park is named for Echo Bluff, a concave bluff that towers over Sinking Creek. The new Echo Bluff State Park opens on Saturday, July 30, and offers the opportunity to explore all the scenic wonders of the Missouri Ozarks. Gov. Jay Nixon will welcome visitors with remarks at 10 a.m., and is familiar with the area. His mother was a counselor at the old Camp Zoe, a children’s summer camp that operated in the secluded valley from 1929 to the 1980s. The picturesque spot along Sinking Creek, which runs below the concave bluff that is the park’s namesake on its way to the Current River, has been drawing visitors for decades, but now is open to the public as Missouri’s 88th state park. The park is off Highway 19, about halfway between Salem and Eminence. It is in the heart of the Ozarks, with conservation areas, national forest and the Ozark National Scenic Riverways nearby. The latter is a national park that preserves the Current and Jacks Fork rivers, two of America’s premier float streams. Bill Bryan, director of Missouri State Parks, said Echo Bluff is the perfect spot for a family vacation with Rocky Falls, Alley Spring Mill, Blue Spring and Peck Ranch Conservation Area among the many destinations within an hour’s drive of the park. “They will find a peaceful escape where they can have as big an Ozark adventure as they want to make,” Bryan said. “This is a base camp for the unchartered Ozarks. The Ozarks, with its bounty of spring-fed rivers, has long been a popular spot for floating on summer weekends. Echo Bluff, which will be open year round, encourages visitors to enjoy the other seasons, especially spring, when the redbuds and dogwoods are blooming, and fall, when the forests glow in autumn colors. North Dakota State Parks are seeing a lot of traffic, both in park visits and overnight campers. Ben Smith reports on the reason why park rangers are so busy. It’s a busy year for North Dakota state parks. Park Rangers say people are coming from all over the country. A main driving force is the low cost for gas..
Karen and David Hicks have done a lot traveling over the last few years, recently they were in Florida with a bunch of other campers. They’re currently staying at Cross Ranch State park which this year, has seen a lot of business. She says it’s because Cross Ranch has newly-upgraded camping sites, as well as a new yurt. Cross Ranch isn’t alone, State Parks across North Dakota are seeing more business. Compared to 2015 which was a record-setting year, the amount of park visits and overnight campers are up about 5 percent. To explain that, we did have a very mild spring. We had a couple of months where we had a lot of visitation where you don’t normally see that. March early April usually the snow and rains, people aren’t out in the parks but this year we had a lot of people out camping already by that time. This year we didn’t have that. He also credits the special events the department puts on for drawing in more crowds. Weixel says North Dakota state parks are seeing over a million visitors every year. North Dakota’s National Parks have also been busier. As of June, Theodore Roosevelt National Park has seen a 30% increase in visitors compared to last year.